Colloquially known as Brooklyn’s hidden suburb (albeit one served by an express subway line), Ditmas Park is distinguished by tree-shaded streets populated by majestic Victorian and bungalow-style homes complete with sleepy front porches and company-ready backyards. Its historically designated boundaries are tightly circumscribed: Ocean Avenue and Coney Island Avenue lie to the east and west, with Dorchester Road to the north and Newkirk Avenue to the south. But the neighborhood’s footprint has expanded in recent, gentrification-heavy decades. Cortelyou Road, the area’s de facto Main Street, is home to organic grocery stores, a local library branch, a bustling weekly farmer’s market, and the lion’s share of the area’s notable bars and kitchens. 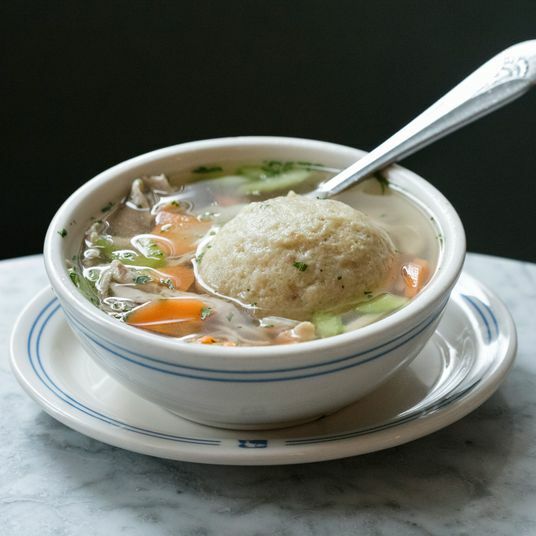 There is also life (and good food) beyond Cortelyou, though, with culinary gems scattered along Newkirk and Coney Island Avenues. For locals and green-eyed real estate peepers alike, there are plenty of reasons to explore this neighborhood. 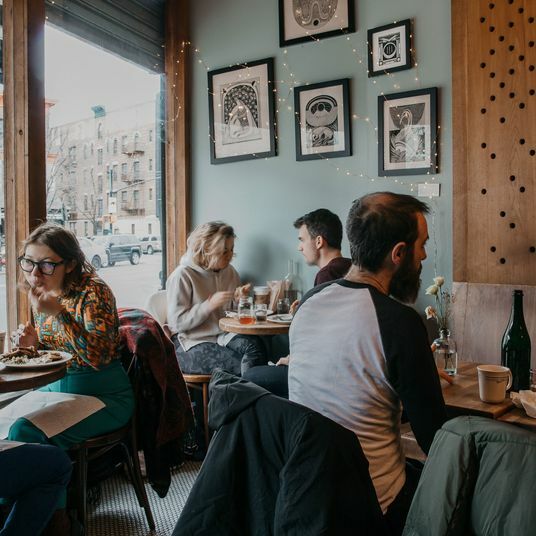 Here, the absolute best restaurants in Ditmas Park. 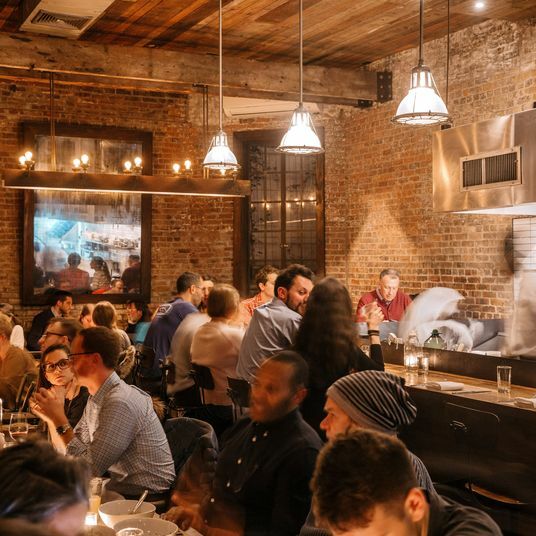 Modern Middle Eastern restaurants are easy to find across New York City these days. But Mimi’s Hummus, which opened here in 2009 before spawning Manhattan outposts, remains one of the best. The hummus, capped with softened chickpeas, spiced, sautéed mushrooms, or a tomato-and-eggplant stew, is ethereally smooth and rich without any lingering heaviness. 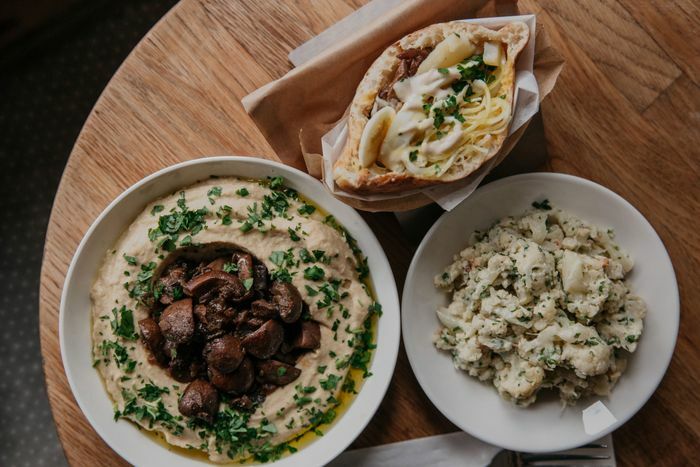 Other must-tries include the gently caramelized roasted cauliflower with garlicky tahini, and the Iraqi pita, called sabich in Israel, which jumbles fried eggplant, sliced boiled egg and potatoes, shredded cabbage, and dollops of smooth tahini and the tangy pickled mango sauce amba into an overflowing flatbread pocket. 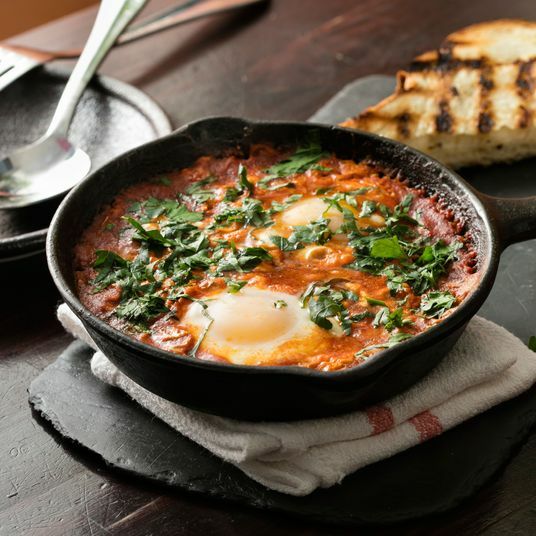 Brunch brings several delightful takes on shakshouka, including one that pairs the eggs poached in rich tomato stew with spicy lamb merguez sausage, and another that swaps the familiar tomato base for braised Swiss chard and sheep’s-milk feta. The Ditmas Park stretch of Coney Island Avenue is densely dotted with South Asian restaurants serving up curries, naan, and a menagerie of syrup-soaked sweets. 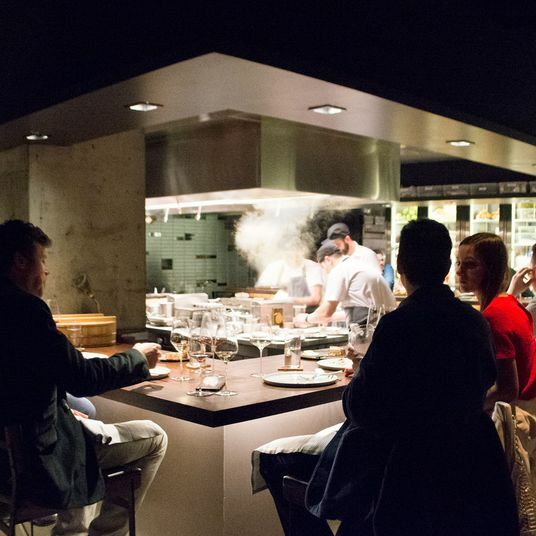 The undeniable standout is also the new kid on the block, having opened early this fall. Cumin seed-dotted samosas come wrapped in a pie crust-textured shell that shatters under your teeth and then melts seductively in your mouth. Mango lassi is delicate and floral rather than cloying, and the butter chicken delivers a complex, slow burning tingle of spice and heat. There is also an ample vegetarian menu, with dishes like plantain kofta curry and vegan biryani cooked in dedicated pots to prevent contact with meat. Jalsa’s decor (black fabric-draped chairs, light fixtures dripping with plastic jewels) feels a bit slapdash and unfinished. 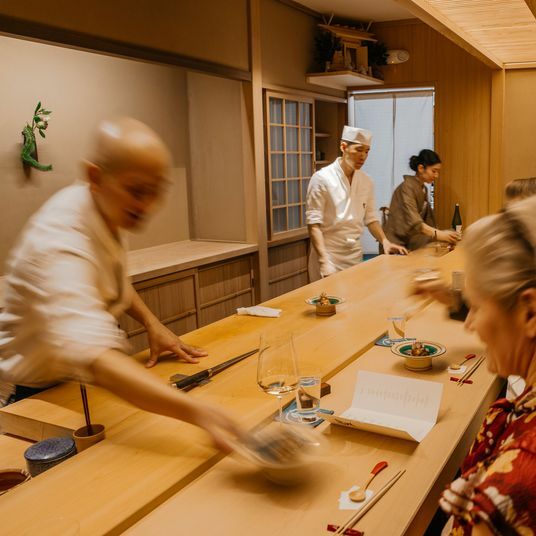 But the kitchen has been knocking it out of the park since day one. An old-fashioned burger for an old-fashioned burger joint. Photo: Scott Heins. 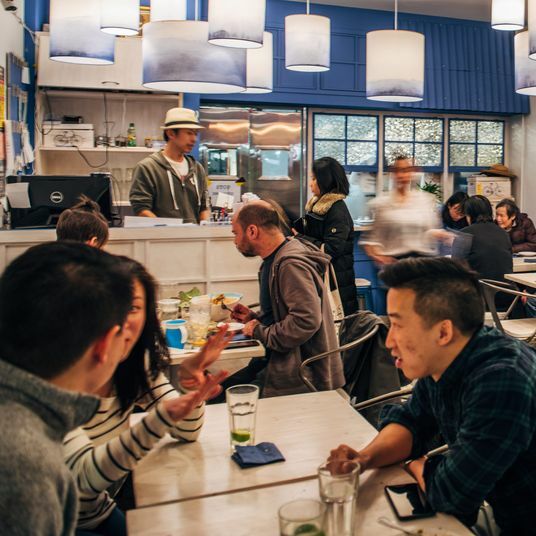 Andrew Zurica faced a significant setback in 2012 when his Mill Basin restaurant, Luncheonette, was irreparably damaged by Hurricane Sandy. He rebounded with Hard Times Sundaes, a burger-focused food truck that attracted media attention and throngs of devoted customers in equal parts. 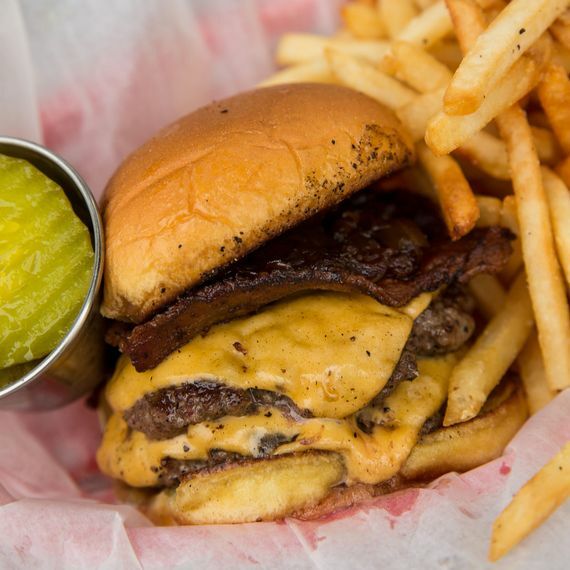 This past summer, he set down new roots with a brick-and-mortar burger joint that flips some of the city’s juiciest ground-chuck patties. The dining room is pint-size (with just four counter seats) and the menu is spare, but your order is simple. Get a burger — a glistening single, double, or triple patty, crowned with velvety, candy-sweet caramelized onions (and cheese, if you like), sandwiched between a squishy Martin’s potato roll. A side of the ultra-crisp and properly seasoned French fries seals the deal. Comfort-food lovers will find a haven in this cozy Viennese gastropub. 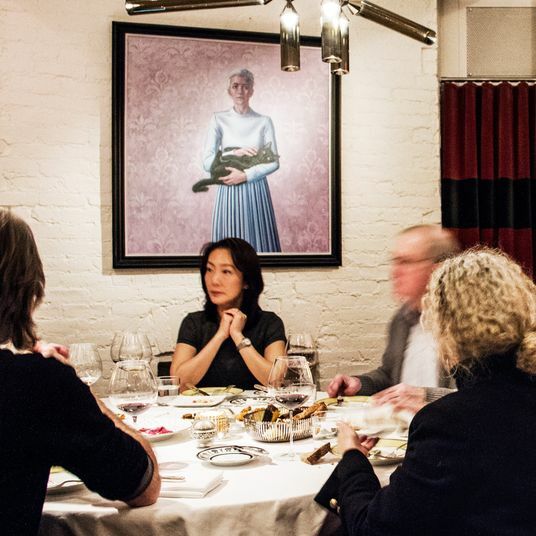 The owner, chef Thomas Ferlesch, is a native of Austria with a decades-long career leading iconic New York City kitchens, including Café des Artistes and Vienna 79. 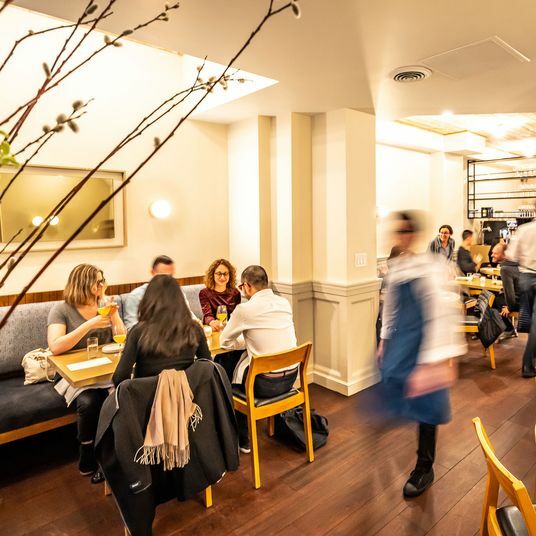 Werkstatt might be likened to a retirement project for Ferlesch — and it is certainly more casual and neighborhood-oriented than those other establishments. But his cooking shows no sign of slowing down. The buttery, oversized soft pretzel, served with paprika-spiked Liptauer cheese-spread, is an absolute must. 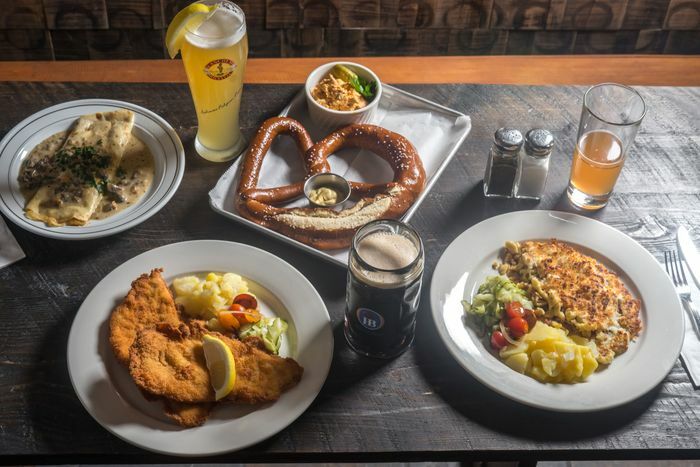 From there, order one of the three varieties of crisp and tender schnitzel (pork, chicken, or planks of celery root) that come with a menagerie of vinegar-laced vegetable salads. Or tuck into a plate of beef goulash, which pairs nuggets of tender meat swimming in a richly-flavored sauce with satisfyingly chewy squiggles of spätzle. A glass of spicy Grüner Veltliner or a citrus-scented grapefruit Hefeweizen from Germany offers reviving contrast. In 2013, Qathra Cafe owner Yasser (Max) Habib expanded upon his area coffee-shop holdings with this spacious corner location. 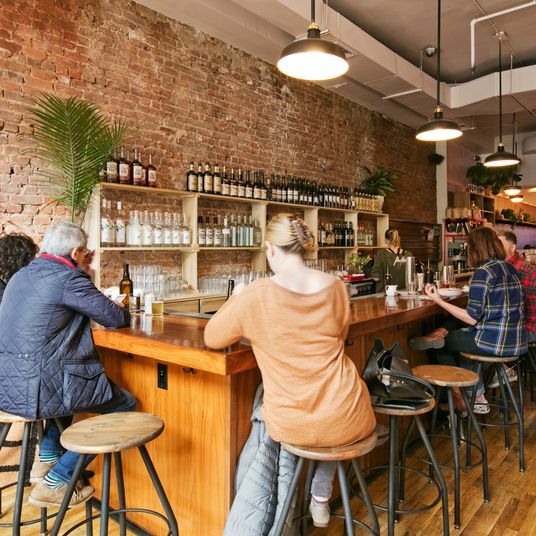 With its Instagram-friendly décor (pressed tin ceiling; iced drinks served in Mason jars; a living plant wall), Milk + Honey quickly became a local favorite. The stellar menu didn’t hurt either. The Egyptian poached eggs are served quivering on toast and generously sprinkled with dukkah, a flavorful condiment made from ground nuts, seeds, and spices. And the crème brûlée French toast, dolloped with sweet-tart berry compote, is category-defining. 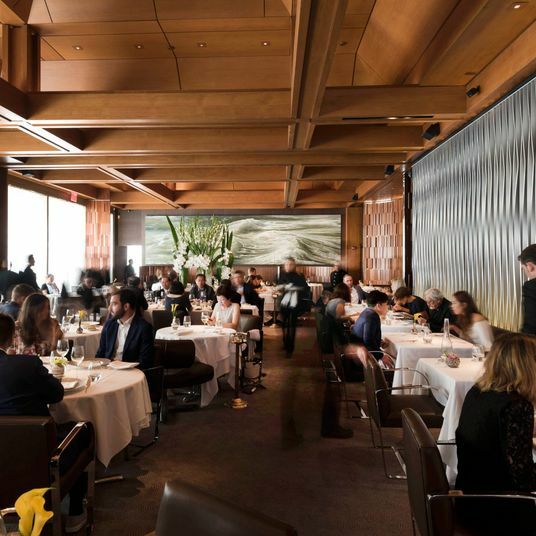 Snagging a seat on a Saturday or Sunday can be a hassle. So either grab a golden turmeric latte and a crunchy-topped oat-and-currant scone to go, or surrender to the glory of weekend pacing. Milk + Honey is worth the wait. 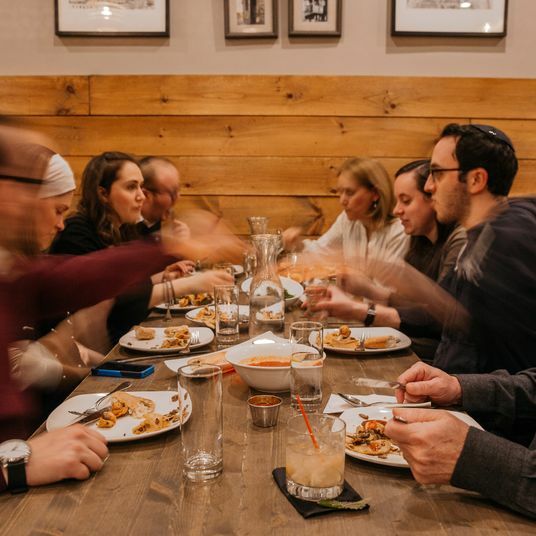 Owned by the folks behind Mimi’s Hummus, this Neapolitan pizza and fresh pasta spot is one of the more sophisticated, date night-approved dining options on Cortelyou Road. And thanks to the accommodating waitstaff and kids’ menu that doubles as a coloring page, it is also decidedly family-friendly. Go with a group and split a couple of the blistered-crust, wood-fired pies — the Romana (tomato, capers, anchovy, sage, and mozzarella) and the Funghi (sautéed mixed mushrooms, provolone, garlic, and buttery pine nuts) make a satisfying match. Round out the order with a plate of chewy pappardelle dressed in brown butter and hazelnuts and piled atop sweet kabocha squash purée, along with the “everything salad,” which is showered with fresh herbs, heaped with roasted squash and hard-boiled egg, and sprinkled with a poppy-and-sesame-seed-based spice mix that nods to New York’s famous everything-bagel topping. 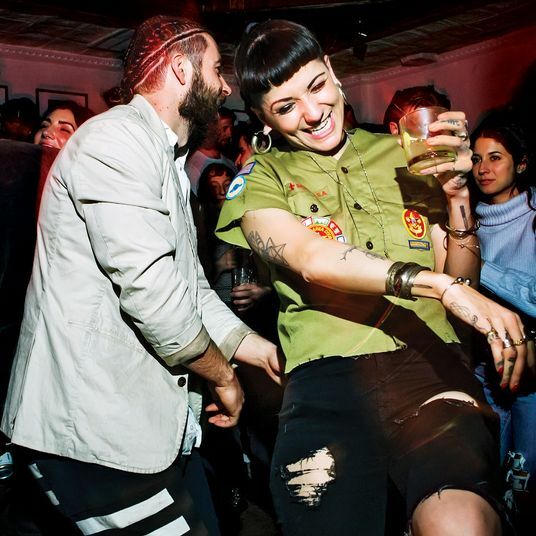 Another sibling of Mimi’s Hummus, this petite, candlelit wine bar, named after surveyor James Cortelyou’s 17th-century map of Lower Manhattan, maintains a fitting vibe of romance and discovery. The wine list is augmented with innovative cocktails like the Beverley Bee, which blends gin, grapefruit juice, lavender, honey, and rosewater into a buzzy, botanical dream. There are a handful of entrées — things like pickled onion-topped hake tacos and a fried-chicken sandwich. 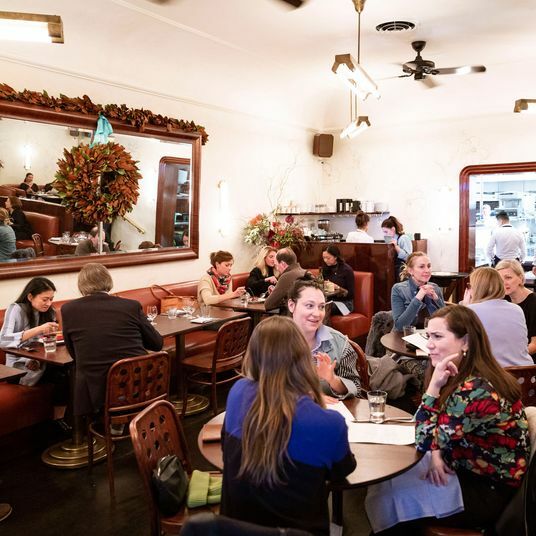 But a selection of small plates, charcuterie, and cheese (a spread of five of them goes for $35) adds up to an ideal and eminently shareable meal. Try the grown-up tater tots (actually housemade mashed-potato croquettes), beet deviled eggs, stewed-mushroom crostini, and a couple of generously-cut wedges of Manchego and rich Dutch goat gouda. This bustling café’s menu rivals a 24-hour diner’s for sheer variety, but it’s geared toward the avocado toast set. Outside, a rotating display of oversized (and downright unsubtle) signage promises “coffeeeeee” and “gooood food.” Fortunately, the kitchen delivers, with laudable cappuccinos, scrambled-egg sandwiches tucked into pillowy cheddar-chive biscuits, watermelon-radish-and-halloumi-topped salads and grain bowls, a crisp and creamy grilled cheese layered with jammy figs and sliced apple, and a dozen varieties of the aforementioned avocado toast. (The smoked-salmon take with ricotta is particularly nice.) Weather permitting, grab a seat at the sun-dappled communal table outside. 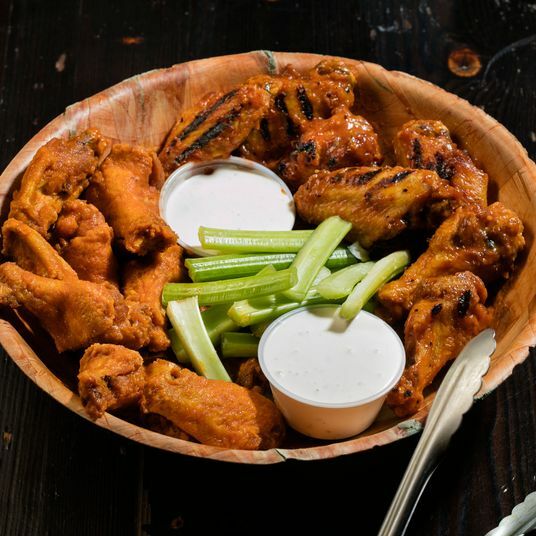 Set on a sleepy, residential stretch of Newkirk Avenue, the Ox Tavern is a homey neighborhood gastropub that’s worth a trek from farther afield. The towering burgers — stacked with crisp onion rings, barbecue sauce, and a fried egg, or chipotle, pico de gallo, and queso Oaxaca, among other options — are complemented by a delightfully global mishmash of small plates. Try the crispy brussels sprouts with togarashi salt or the chubby fried pickle spears, and pair it with a refreshing Sleepy Head cocktail (gin, lime juice, mint, and ginger syrup splashed with soda). And if your entrée does not come with fries, grab a side order if only to dip them copiously in the fruity, lightly smoky house-made ketchup. The Farm and its grits and eggs. Photo: Scott Heins. 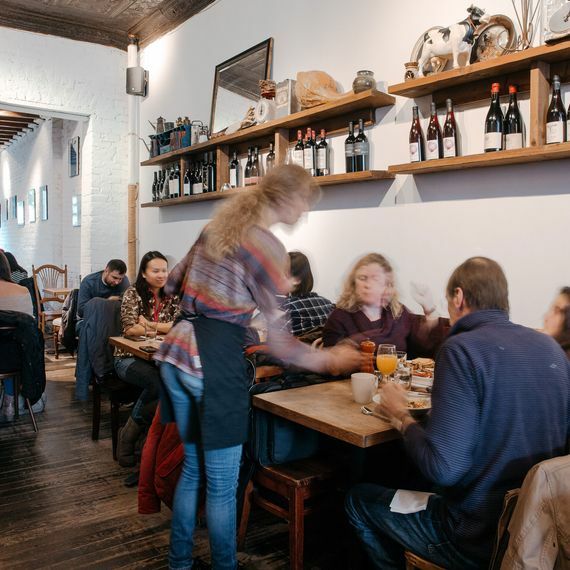 Launched in 2006 at the height of the farm-to-table moment, this rustic, local grower-supporting eatery has become a Cortelyou Road fixture. 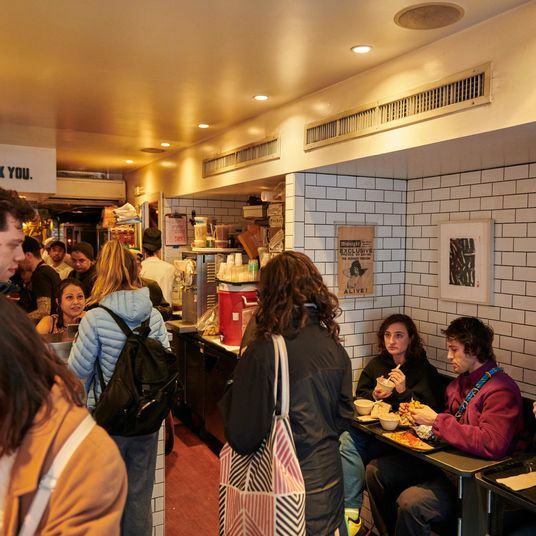 The Farm remains a reliable place to bring hungry out-of-town guests, or to grab a bite before a show at the nearby Kings Theatre. But it shines brightest at brunch. 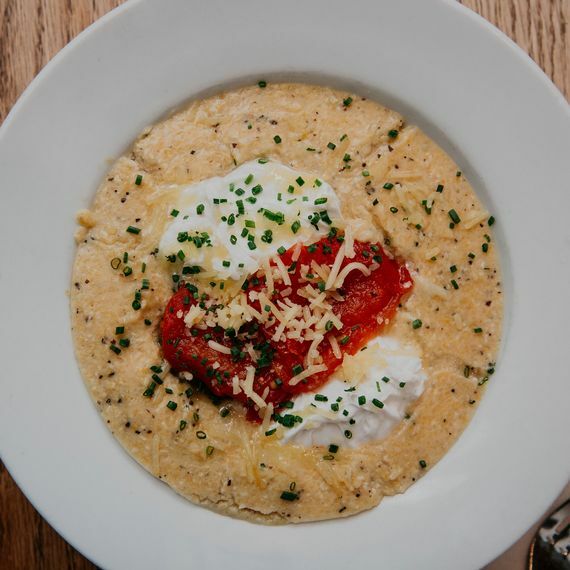 Order the grits (stone-ground by Pennsylvania-based Castle Valley Mill), rendered creamy and sharp with pecorino and topped with a yolk-oozing poached egg. Or start the day with the red flannel hash, a sautéed jumble of beets, potatoes, and either mushrooms or briny bits of corned beef. Both versions are paired with a fried egg and vinaigrette-dressed greens that gently cut through the richness. 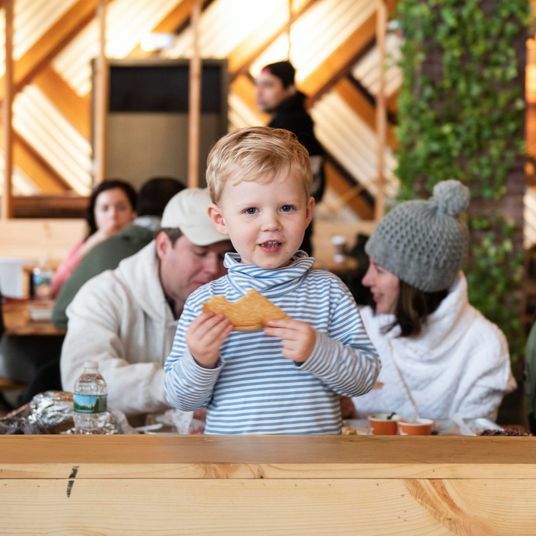 This burger and ice cream outpost opened this past summer, and has already proven itself successful in offering a little something for everyone. The burgers are made with grass-fed beef and topped simply (mustard, ketchup, lettuce, pickles) or extravagantly (kimchi, crispy egg, blue cheese). For non-meat eaters, a grilled-salmon-steak burger with roasted red pepper sauce or an unfathomably vegan Impossible Burger awaits. 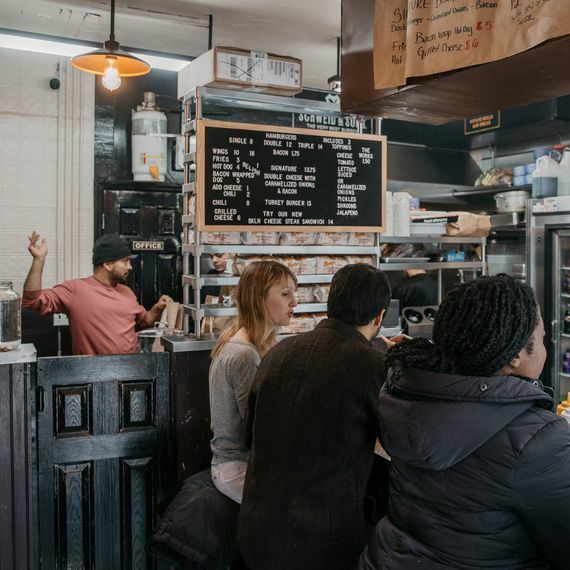 The fry options include both regular and sweet potato, gluten-free buns are available, and the ice cream bar’s flavors (sourced from artisanal darlings Jeni’s Splendid Ice Creams and Brooklyn’s Blue Marble) are ever-changing. If Blue Marble’s Bread and Roses flavor is available — its heady rosewater base is threaded with crushed vanilla shortbread cookies — be sure to make room for dessert. 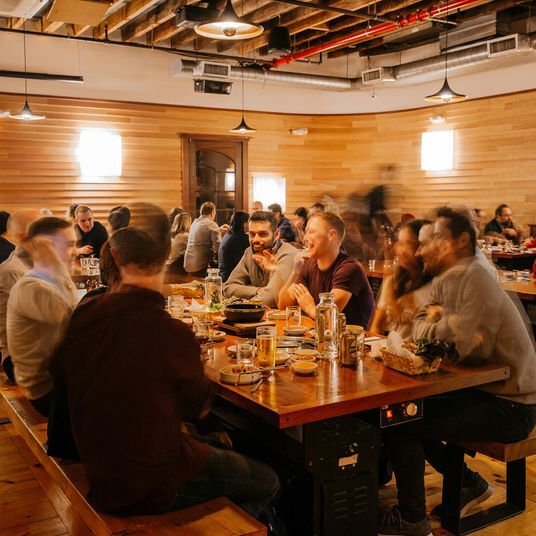 With its sunny interior and blond wooden tables, this Indian-inspired eatery (which shares ownership with Cafe Madeline and Pasture Burger across the street) evokes the cheerful serenity of a yoga retreat’s dining room. The regularly rotating selection of saags, curries, and kormas on the expansive, cafeteria-style hot bar are gently spiced, but far from bland. They come brimming with tender chunks of winter squash, zucchini, and cauliflower, and perfumed with toasted cumin seeds and slivers of sweet coconut. 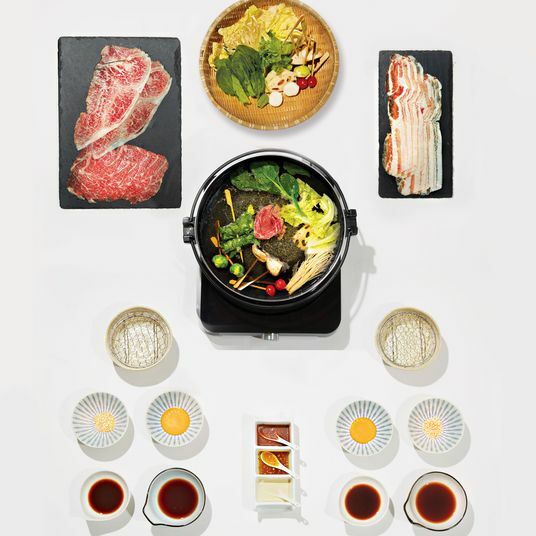 A bowl (diners can choose between small or large) piled with rice and a painter’s palette of meat or vegetable stews is amply filling. And the menu of vegan, coconut milk-based lassis (blended with raspberry, strawberry, avocado, blueberry, turmeric, or pineapple, as well as the expected mango) is worth exploring. Nestled into a hidden sliver of real estate between a bodega and the Cortelyou Q stop, and hovering just above the outdoor train tracks, this Tibetan restaurant is one of the more unique places to dine in the neighborhood. 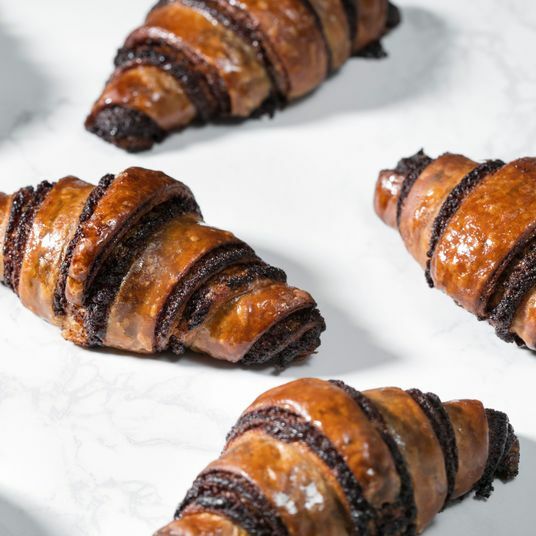 There are some missteps on the menu, but the momos are solid (opt for fried rather than steamed), and the saucy lamb curry and sha-baklap (beef patties encased in flaky pastry) are real treats. In the colder months, grab a seat in the narrow, hunter-green dining room and nibble a bowl of chana-khatsa, simmered chickpeas lacquered with a mix of fiery Tibetan hot sauce, ginger, and garlic. And when its warm out, opt for an outside table and catch the free show of silver-topped subway cars slipping in and out of the station.